Archadeck of Columbus is now offering landscaping to compliment your beautiful Archadeck backyard as part of our mix of variable sources. Now you can have your cake and eat it too! 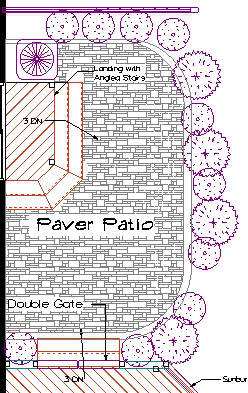 This paver patio architectural rendering includes the landscape plan as well. One way to put the icing on an a great outdoor design is through beautiful landscaping. Perennials, annuals, and foundation shrubs can make or break the entire feeling you are trying to convey in your backyard. An appealing outdoor structure such as a deck, patio, porch or even hardscape pathways looks lost without appropriate surrounding landscaping. For example, you finally install that new breathtaking hardscape patio descending from your deck with a wonderful view of your entire backyard.Look around at the turf. Do you want to see dirt, weeds, or just mulch? Or would you rather enjoy your new outdoor oasis surrounded by color and the luscious greens of plants? I am certain most homeowners would choose the latter without a doubt. For this very reason Archadeck of Columbus has entered into helping homeowners finish off their deck or outdoor structure by offering landscaping preparation and installation. One benefit of having us do the landscaping is that there’s a degree of excavation that occurs while your outdoor structure is under construction. Since the soil surrounding your outdoor project is generally loosened, it becomes the perfect time to add landscaping. We can use the soil, add amendments such as compost or additional soil if needed. We can also assist in installing the plants you have chosen as well as finishing it off with a spade edge and spreading the mulching material of your choice. 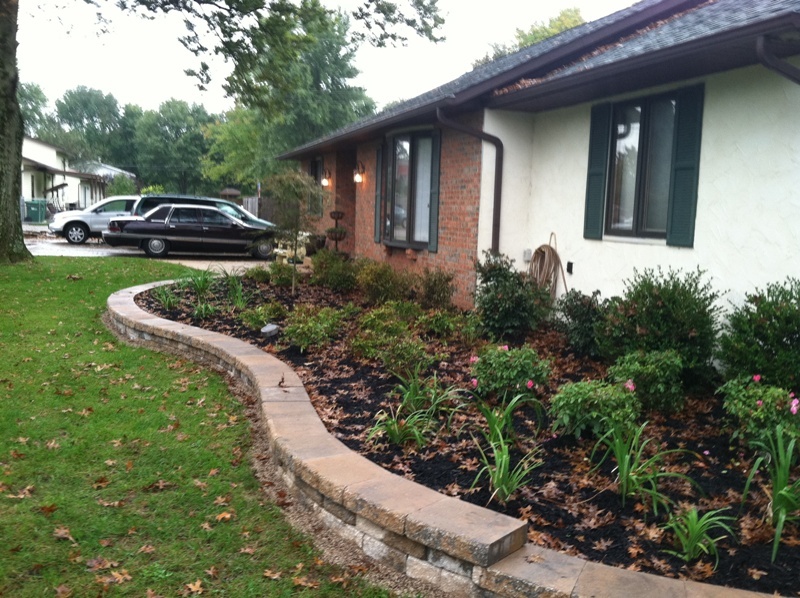 This custom hardscape wall in Columbus, OH comes to life with gorgeous landscaping. Some things you will need to consider if you are planning on adding your landscaping at the time of your outdoor structure addition is the traffic flow of your addition as it will relate to the width, height and spread of the specimens you choose to plant. You will also need to consider the amount of the sun your area receives each day in relation to your project, this will help you determine which plant material will work best in the area. Maintenance of your plantings is another key factor in helping you make the decision of choosing a perennial or annual border. Perennials require less maintenance in most settings because they don’t require re-planting each season like annuals do. A good idea in landscaping is to use perennials as your foundation border and add in splashes of annual flowers for color each season. Such as Pansies in the autumn months, and geraniums in the summer. This will add variety to your landscape and the change in mood you can portray in the view from your outdoor structure season to season. This porch plan has the landscaping already mapped out, another one of our variables in service we now offer our clients.